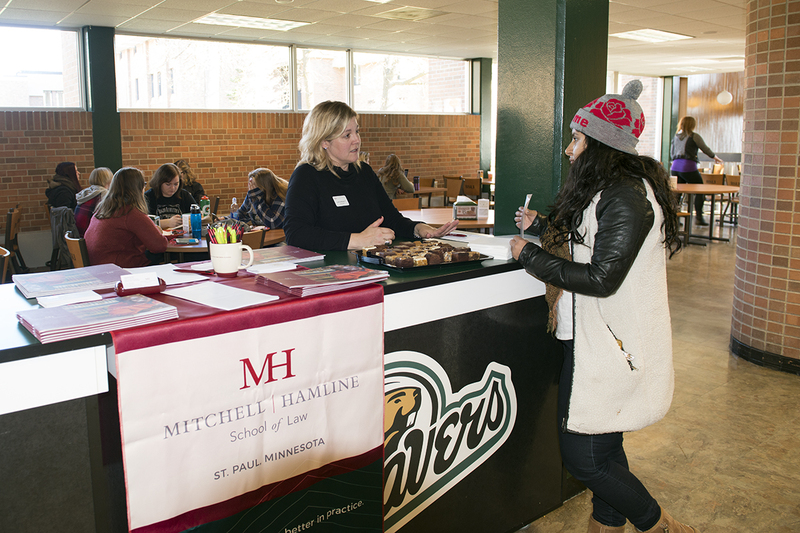 Under a new transfer agreement, signed on Nov. 4 between Bemidji State University and Mitchell Hamline School of Law, BSU students can complete their undergraduate and law degrees in a total of six years, rather than the traditional seven. The agreement was signed by Dr. Faith C. Hensrud, BSU president, and Mark Gordon, president and dean of Mitchell Hamline School of Law. Gordon said the agreement was part of Mitchell Hamline’s goal to deepen its relationships with public institutions from across the state of Minnesota. The “3+3” transfer program will require BSU students to complete a minimum of 92 undergraduate credits before transferring to Mitchell Hamline. There, students will complete both their final year of undergraduate coursework and their first year of law school, transferring between 12 and 28 upper-level credits back to BSU to complete their bachelor’s degree. After this crossover year, students will then spend three additional years at Mitchell Hamline, allowing them to complete both their undergraduate and law degrees in just six years. Students in any BSU department or program who have an interest in law school can potentially participate in the transfer partnership, although they must be admitted into Mitchell Hamline under the school’s normal process. Each academic department at BSU wishing to participate in the program will identify Mitchell Hamline courses that may fill requirements in that department’s major or minor programs. Mitchell Hamline courses may also be considered elective credits for some students. For freshman Alejandro Ketchel, a political science major from Otsego, Minn., the agreement between Bemidji State and Mitchell Hamline offers an opportunity for him to pursue a lifelong dream. After the signing ceremony, admissions representatives from Mitchell Hamline visited with Ketchel and other BSU students in the Hobson Memorial Union. 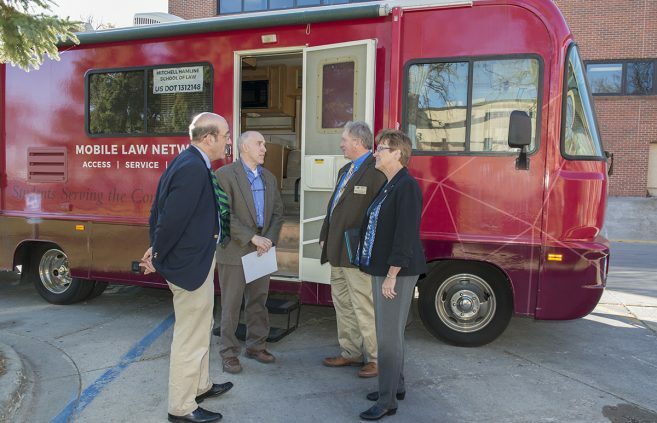 Students also could tour Mitchell Hamline’s Mobile Law Network RV – a custom vehicle nicknamed “The Wheels of Justice” featuring two private office spaces. 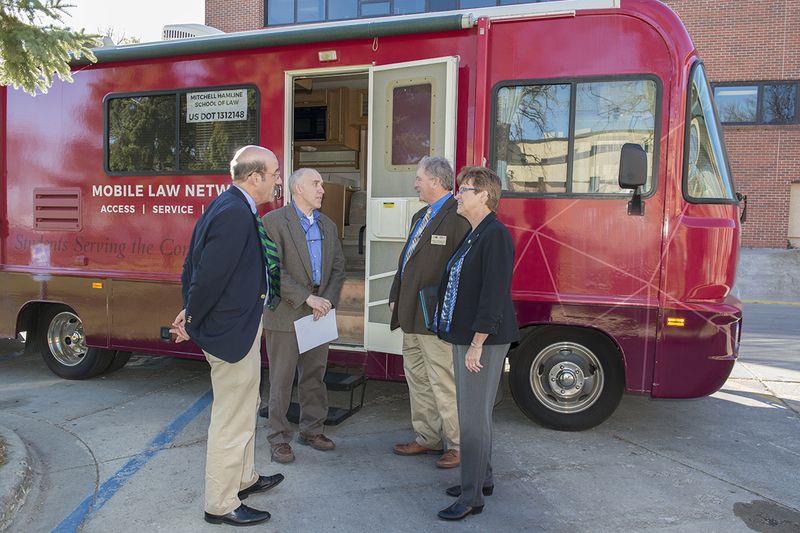 The vehicle, which debuted earlier this fall, takes law students around the state to support a variety of legal services, focusing primarily in the areas of family law, criminal expungements and advance health care planning. With roots dating to 1900, Mitchell Hamline School of Law was established in December 2015 through the combination of William Mitchell College of Law and Hamline University School of Law. It is the largest law school in the region, with approximately 1,000 students and 42 full-time faculty. It has nationally ranked offerings in alternative dispute resolution, health law, part-time programs and clinical education; an array of certificate and dual-degree programs; and an alumni network of more than 19,000. Mitchell Hamline offers more enrollment options than any other law school in the country, with full-time, weekend and part-time programs, including the nation’s first on-campus/online juris doctor program at an American Bar Association-approved law school. 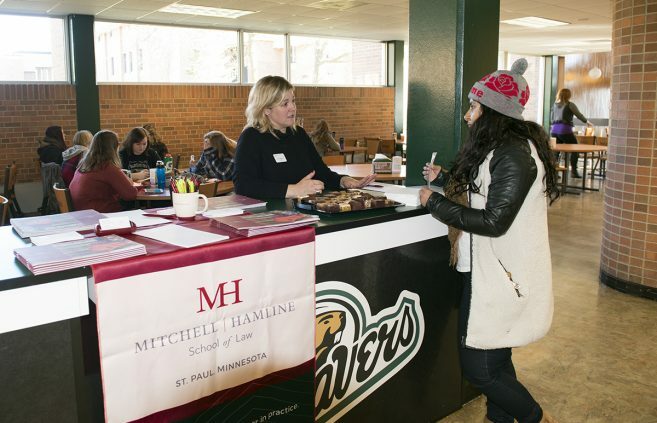 Mitchell Hamline is an independent law school that enjoys an enduring relationship with Hamline University, allowing students to earn dual degrees and have access to Hamline’s athletic facilities, library and cultural programs. Making its debut in Sept. 2016, the Mobile Law Network allows Mitchell Hamline’s students to provide free legal assistance throughout Minnesota. A specially designed vehicle – nicknamed “The Wheels of Justice” – takes students to support a variety of legal services, focusing primarily in the areas of family law, criminal expungements and advance health care planning. Students provide information and assistance to those representing themselves and others who need guidance on legal matters. The vehicle is equipped with two private office spaces, allowing students to hold simultaneous confidential meetings with potential clients. Bemidji State University, located in northern Minnesota’s lake district, occupies a wooded campus along the shore of Lake Bemidji. A member of the colleges and universities of Minnesota State, Bemidji State offers more than 80 undergraduate majors and 11 graduate degrees encompassing arts, sciences and select professional programs. Bemidji State has an enrollment of more than 5,100 students and a faculty and staff of more than 550. University signature themes include environmental stewardship, civic engagement and global and multi-cultural understanding.